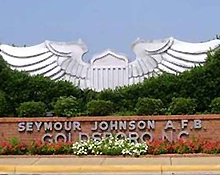 The 4th Fighter Wing is the host unit at Seymour Johnson Air Force Base, and accomplishes its training and operational missions with F-15E Strike Eagles. Two of the wings’ four fighter squadrons are operational units, capable of deploying world-wide on short notice and immediately generating combat power. The other two squadrons are responsible for training all F-15E aircrews for the Air Force. The base occupies 3,300 acres in Goldsboro, North Carolina. Goldsboro is a medium sized town with a moderate cost of living.